From local acts to globe-trotting productions, theatreA� artistes tell us why home is where the art is. by society to find a groom (Tale of a Tall Girl), to the madness that follows the release of a film here (First Day First Show). Most productions had an unmistakable Chennai connect, peppered with the little things that make up the character of the city. Speaking about the trend, Tamil actor and founder of Theatre Y, Yog Japee (who was part of the jury of the theatre festival) says, a�?Every single aspect of Chennai lends itself to storytelling. Ita��s rich and diverse in so many waysa��you can celebrate it, crib about it, whine about it and praise it. But every whine, praise and celebration has a story behind it.a�? We decided to explore the phenomenon further and talk to those artistes who have literally put the city in the spotlight, with scripts, themes and characters. With around 103 productions to its namea��from plays such as Ringa Ringa Roses, inspired by La Ronde, which had a Chennai ?Noir inspiration, to Solladi Sivashakthi in Tamil, which was based on the stories of the then city-based writer Andal Priyadarshinia��the 16-year-old companya��s repertoire has showcased unmatched versatility with respect to its content. His recent Tamil directorial, Aurangazeb, by theatre community Shraddha, has received rave reviews across the board, and V Balakrishnan, the artistic director of Theatre Nisha, says the citya��s earnestness to learn is a constant source of inspiration. However, he feels that we have few peoplea��with regards to education and experiencea��when it comes to sets, light and costume design. a�?But these few are brilliant and of international standards. Natesh Muthuswamy, Michael MuthuA�and Victor Paulraj for sets and lights, and Neela Krishnamurthy and a few others for costumes.a�? On how the citya��s theatre compares with other metros, he feels that, a�?In ChennaiA�itA�is still largely part time and a lacunae exists A�in terms of earnest work.a�? Having taken their productions to countries like South Africa, the US, Australia, Singapore, the UAE and Malaysia, one of city-based collaborative Stray Factorya��s objectives has been to go a�?glo-cala��a��taking local aesthetics to a global stage. 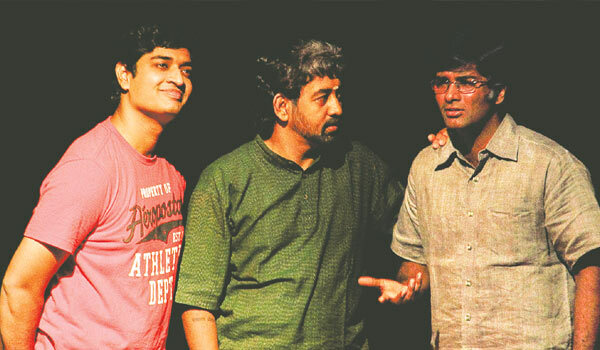 Be it their production, My Name Is Cine-maa, the short 10-minute play, Jolly Pattinam 2065a��which ponders on a future prediction of the citya��or even their web series, Black Sheep, all have culled out factors that make the city unique. a�?I think pretty much all our plays have a little bit of a Chennai connect. Over the last few years, we have continuously increased that connect because we wanted to identify more with the city and its people,a�? Mathivanan Rajendran, the six-year-old theatre groupa��s founder, tells us. He adds that Chennaia��s unique way of celebrating things is one thing that continues to inspire him. Having done more than six full length productions and about 10 short plays, the group is currently working on a Tamil Nadu-based script set in the British era. While The Ordinary City didna��t win the best production (it was the runner up) at the Short + Sweet theatre festival, it did win a lot of hearts. With its story of someone who comes to the city with preconceived notions about Chennai, but ends up not wanting to leave it, the production, directed by Janardhanan Raghavan, was endearing for its simple storytelling and nuanced performances. With a mix of short plays and full length theatre productions, the more-than-four-year-old Quid Pro Quo has had flavours of the city infused in other scripts, too, such as the recent 108 or 1008: That ?I?s ?T?he ?Question, which showed a day in the life of every young Tam Brahm boya��s life. a�?Pretty much whatever we have done has always had a trace of the city,a�? says the co-founder of the theatre company, who is currently fleshing out the script of Damayanthia��about a Sri Lankan refugee family settling in Chennaia��which was also staged at the festival. Besides their campus drives and college initiatives, CreaShakthi is known for its locally-themed scripts. Their recent production, the Tamil adaptation of William Shakespearea��s The Tempest, was set in Chennai during the floods. a�?There has been a conscious effort over the last one-and-a-half-years to bring in more local references and things people can relate to,a�? says Dushyanth Gunashekar, founder of the five-year-old theatre group, which has done over 364 showsA� and is currently working on seven productions which will allA� a�?in a certain way have a Chennai connecta�?.